Will product packaging change with the rebranding? Yes, product packaging will change. We anticipate that customers will start see our new packaging beginning in June or July. Please see below a mock-up of our new packaging. Based upon customer feedback, we’ve simplified our packaging. Will the product labeling change with the rebranding? Yes. Customer feedback was our previous branding strategy was confusing. We’ve simplified our branding to better tie our brands together. Below is a sample of our new chest label. 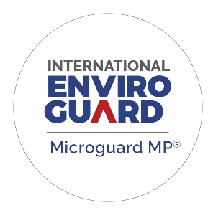 Is the ownership of International Enviroguard changed? No, the company still has the same corporate structure. The rebranding has no impact on the organization’s leadership. Has product sources or quality changed as a result of the rebranding? No, we are still using the same production standards and quality processes as we did prior to the rebrand. Will you have new marketing materials and catalog? Yes, we will have new marketing materials. We anticipate all of our marketing materials will be updated and available online by May 1st. Our ChemSplash flyer has already been updated and can be viewed here. There were things on the old website I can’t find, where can I find them? 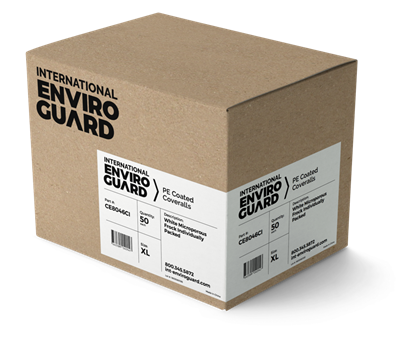 Please reach out to your International Enviroguard representative, and we can help find it. If not available on our new site, we’ll get it to you – and take that as feedback to get updated on our new site.